The Cobb County Department of Transportation (DOT) is developing, in phases, the Silver Comet Trail, a 12.8 mile multi-use paved trail to run through parts of southern Cobb County. Following an abandoned CSX Railroad Corridor, formerly traveled by the Silver Comet passenger train, the trail will ultimately extend 57 miles through Cobb, Paulding and Polk counties. Current plans call for this section to one day link with other trails and allow direct access between Atlanta and Birmingham. 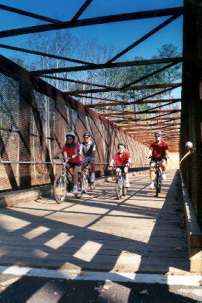 Traversing six trestles and bridges, the trail offers spectacular views of and direct access to one of Cobb's newest recreation areas, Heritage Park. 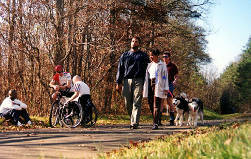 The Silver Comet Rail Trail is asphalt paved, and is designed for use by all - casual walkers, hikers, joggers, bicyclists, in-line skaters, and persons with disabilities. Pets are also welcome, as long as owners obey county leash laws - which will be enforced - and remove animal debris. Three trailheads offer parking, restrooms, water fountains and related amenities. Residents are encouraged to walk or cycle to these access points. 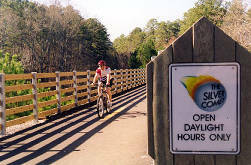 The City of Powder Springs has developed a trail system that ties in to the Silver Comet. For your safety, security will be provided by a special bicycle unit of the Cobb County Police Department. For more information on the Silver Comet Trail, call Cobb DOT at (770) 528-1679, or visit their website for complete info on trails in Cobb County.